For the past several months, Doyle and I have been training for the grueling 260-mile ultra-marathon Texas Water Safari canoe race in June. We have paddled almost 200 miles together on the upper sections of the race course and have improved considerably over the past several months. Yesterday, we finally got to put our training to the test as we competed in the Texas River Marathon. 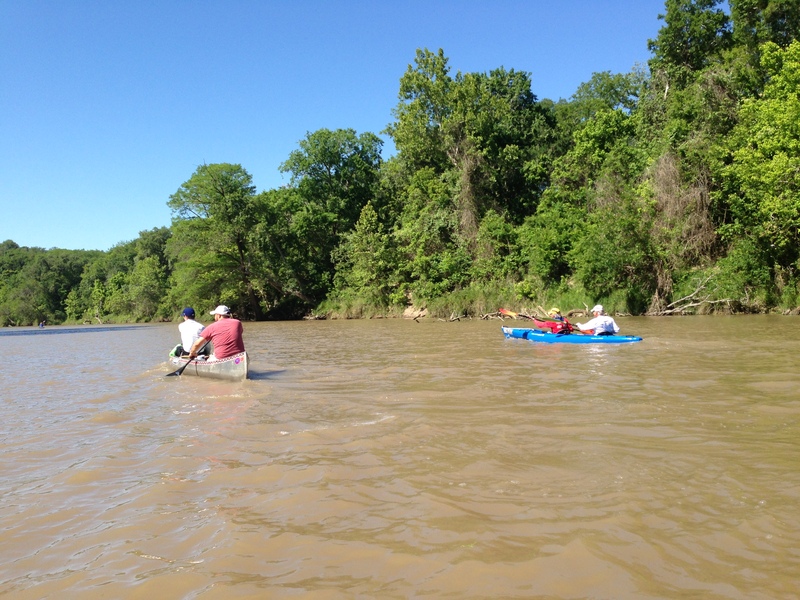 The Texas River Marathon is a fast-paced 34-mile canoe race on the Guadalupe River. The race starts in the old town of Cuero and ends in Victoria, Texas. This race is important because it is the preliminary race for the Texas Water Safari in June. The finishing positions on this race are used to determine starting positions on the Texas Water Safari. Doyle and my son Jonathan at the start of the race. 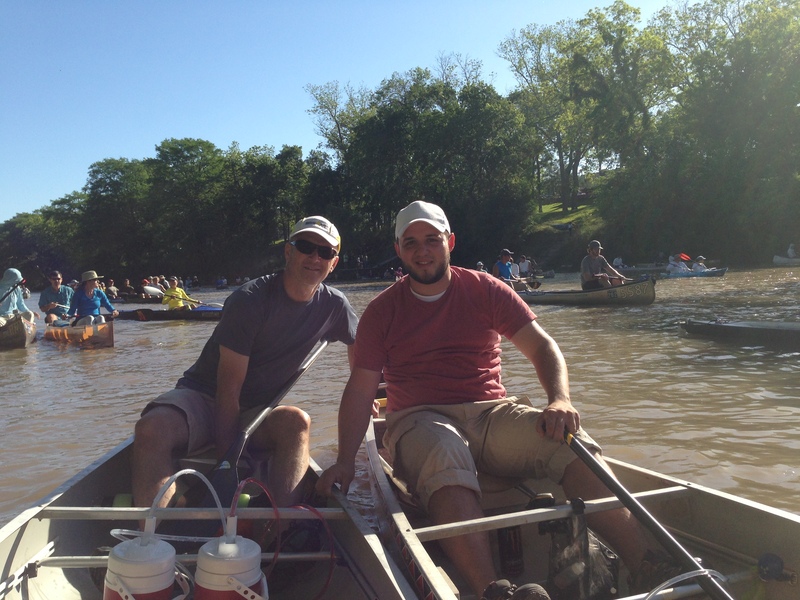 This year’s Texas River Marathon was my eighth marathon canoe race and Doyle’s first. I was especially glad to see my son Jonathan at the race and many friends from past races. The paddling community in Texas is one of the friendliest bunch of folks I have ever met. There is never a shortage of encouragement from seasoned racers and the crowds along the way. As one of the newer guys on the paddling scene, I have always felt welcomed at these races. 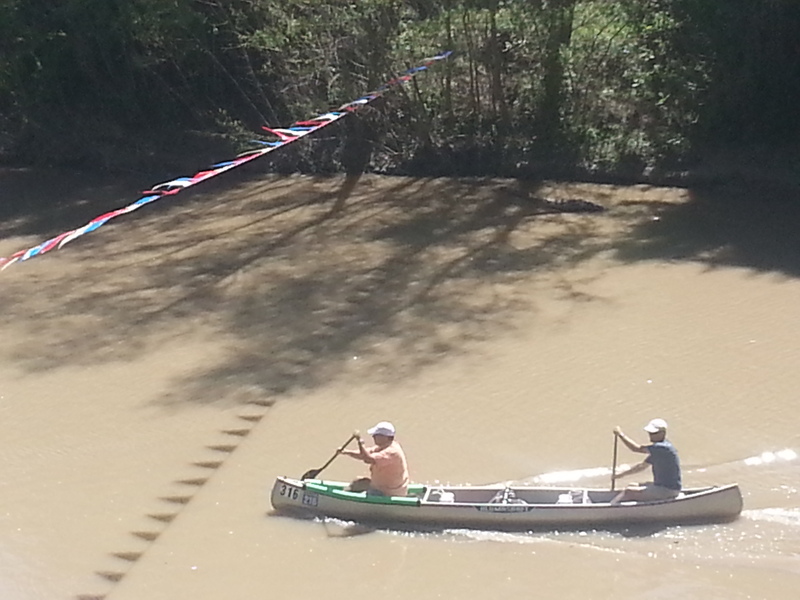 My son Jonathan and Bob pulling ahead in their aluminum canoe. This year’s Texas River Marathon was shortened from 39 to 34 miles because of changes in the start and finish points. Doyle and I set a goal to finish the course in seven-hours or less. We enjoyed paddling with my son Jonathan and his paddling partner Bob on part of the course. But, of course, these young boys eventually pulled ahead while Doyle and I just tried to maintain a steady pace. Our goal for the water safari is to maintain a pace that will enable us to finish the course in less than the 100-hours time limit. Reaching the finish line in Victoria, Texas. 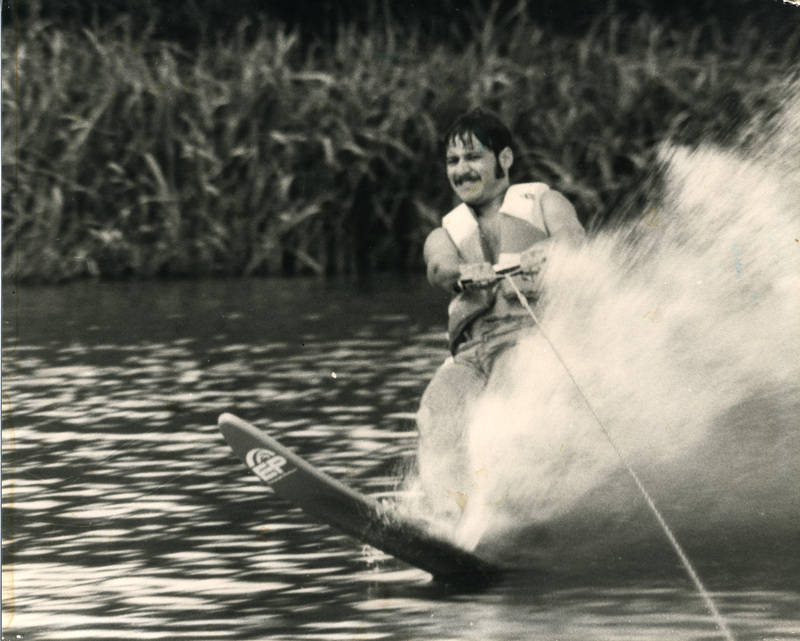 Water skiing on the Aransas River in 1979. In some ways I wish I still had the strength I had when I was a young guy having adventures on the water and on the slopes. But the reality is that I can still have a great time doing hard things if I will just pace myself and enjoy the journey. I am glad that my son Jonathan encouraged me to join him in competing in marathon canoe races when I was 55-years old. I like the challenge of doing hard things because it keeps me young at heart. So, I plan to keep paddling and portaging and enjoying the challenge of hard things for as long as I can. Well done. Congratulations Omar and Doyle! Your comments about wishing you had the strength of your younger years got me thinking too. In God’s ‘economy’ physical strength may wane, but He grows our wisdom through life experiences over the years as we walk with Him. If I had to choose between youth (young and dumb) and wisdom (older and wiser), I’d take the wisdom! I love that He encourages His kids at each stage of our lives in Isaiah 40:30-31: “Though youths grow weary and tired, and vigorous young men stumble badly, yet those who wait for the Lord will gain new strength; they will mount up with wings like eagles, they will run and not get tired, they will walk and not become weary.” We may be moving from the ‘running’ to the ‘walking’ stage of this life, but I’m thankful that though the ‘outer man is decaying’, He daily renews us on the inside, and faithfully empowers us to keep moving forward and onward toward the prize! Good word, Pam. I prefer older and wiser and trusting God to renew my strength. Congrats to you both! I love what you say about doing hard things and staying young at heart. That sentiment drives my races as well, and I always love seeing people out there with many more years on them than I have because it gives me hope that I can stay healthy, train smart, and continue racing well into the future. Thanks for sharing your efforts and successes with us! Thanks, Donna. I too love the inspiration I receive from watching those who are even older than me on the river. They give me hope that if I stay consistent I too can enjoy many more years of adventures on the water. I wish you the best in your races. Keep running! It was a fun race, great job. We were right there with you. We’ll see you at the safari! Thanks, Alan. Look forward to seeing you at the TWS in June.